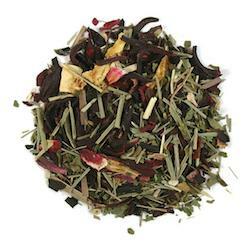 Blades of lemon grass, red rose hips, hibiscus petals and orange peel. Fragrant, sweet lemony aroma. Infusion is a beautiful pinkish purple. Fruity, lemony, grassy flavor with a hint of peppermint. Directions: Pour 6 oz boiling water over 1 tsp of tea. Steep 3-5 minutes. Strain and serve.